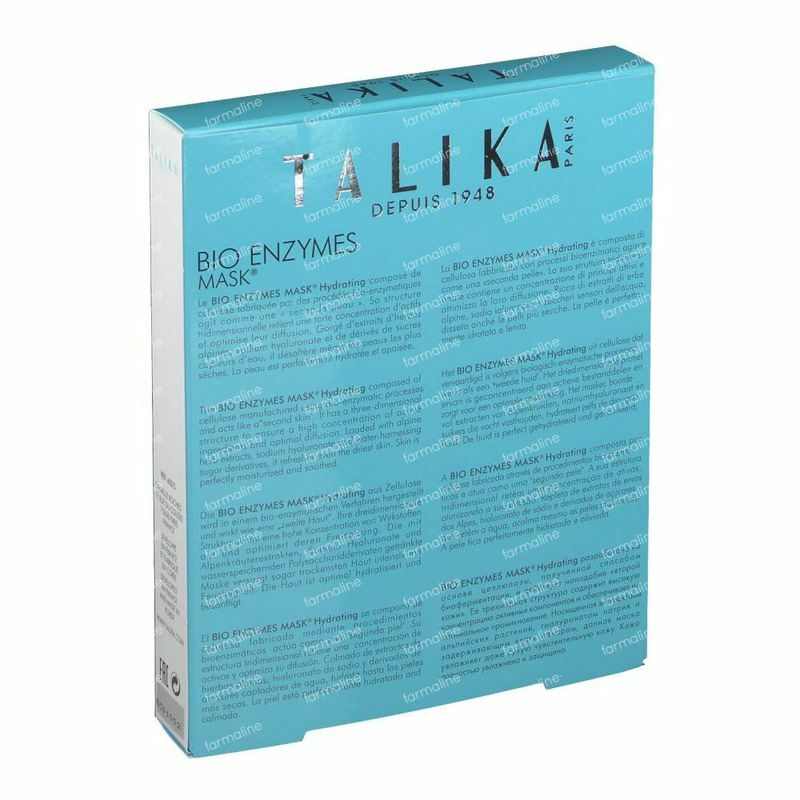 Talika Bio Enzymes Hydrating Mask PROMO PACK 5 pieces order online. The Purifying Bio Enzymes Mask has a three dimensional structure to retain a very high concentration of active ingredients which are spread evenly over the skin. It acts like a "second skin". With alpine herbs, sodium hyaluronate and hydrophilic sugars, it restores dry, sensitive skins. After use, the skin is perfectly mosturized*, softened, soothed and infinitely more beautiful. * Upper layers of epidermis. -Alpine flowers heal and protect, and Hyaluronic acid replumps and softens the skin. A sheet mask with a deep hydration complex containing alpine flowers for dehydrated skin. 1. Remove the plastic sheet. 2. Place mask onto clean face. 3. Remove the other protective sheet from the mask. Leave on for 15 to 30 minutes. AQUA/WATER, BUTYLENE GLYCOL, GLYCERIN, SODIUM HYALURONATE, DICAPRYLYL CARBONATE, PEG-60 HYDROGENATED CASTOR OIL, SACCHARIDE ISOMERATE, CHLORPHENESIN, PARFUM/FRAGRANCE, ARNICA MONTANA FLOWER EXTRACT/ARNICA MONTANA (ARNICA) FLOWER EXTRACT, GENTIANA LUTEA ROOT EXTRACT/GENTIANA LUTEA (YELLOW GENTIANE) ROOT EXTRACT, ACHILLEA MILLEFOLIUM EXTRACT/ACHILLEA MILLEFOLIUM (COMMON YARROW) EXTRACT, ARTEMISIA VULGARIS EXTRACT/ARTEMISIA VULGARIS (MUGWORT) EXTRACT, CARBOMER, LIMONENE, LINALOOL.